Good morning friends! For those who did not know, our baby boy’s adoption was finalized just last week! We couldn’t be more excited! I waited to publish Chapter Two of our adoption story until the adoption was finalized due to a couple of harassing comments I received on my blog. 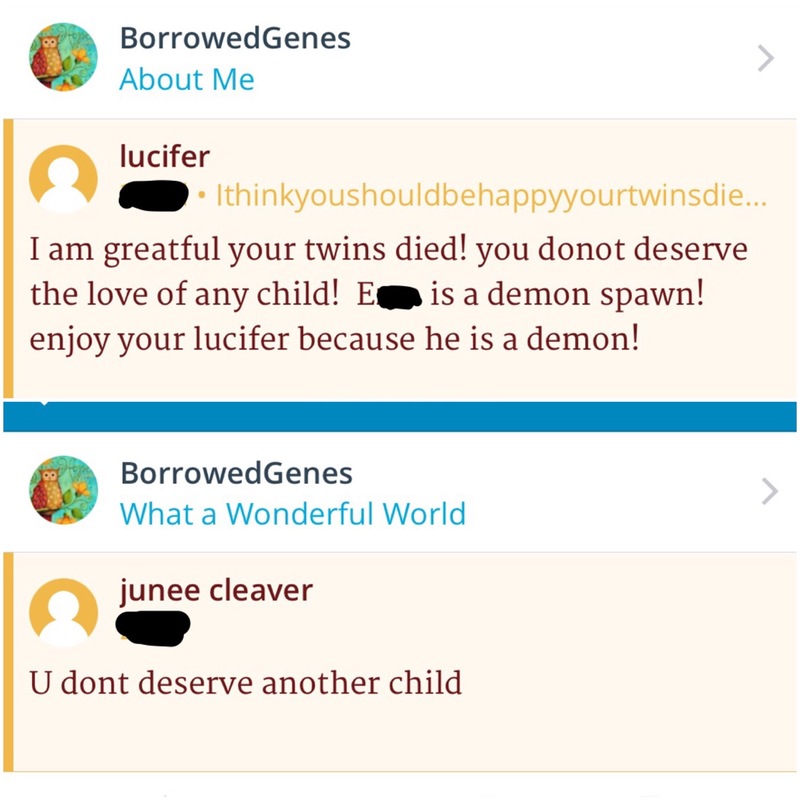 I’m still not entirely sure of the motivation behind these sentiments, but I know WHO wrote them because using an anonymous account or calling yourself “Lucifer” simply does not erase your digital footprint. 🙄 I’m not sure if I’m more disappointed in their cruelty or their ignorance. The initial horrifying shock of seeing these comments was more than mitigated by my “in yo’ face” moment of triumph when I used Google Analytics to trace their identities. It took a while but I did it. I am so very happy to say that they are not anyone involved in the adoption process whatsoever. I wanted to share these comments (below) with you as a way of explaining my hiatus, and also to illuminate the fact that this kind of inexplicable harassment does happen. I had read about people experiencing it on their blogs, but other than one small trolling about a year ago, I was not one of them. I don’t want you to be either. Set your security settings higher my friends! I already did. Furthermore, I needed to be sure these two douche canoes weren’t a threat to my kids. They are not. They are a couple of sad people, unknown to each other (I assume), who terrorize others under the guise of anonymity. One is a fellow blogger who is staunchly anti-adoption (not sure how she took an interest in me, I do not follow her) and one is someone…from high school. Yes, you heard that right! High school. Apparently, nearly 20 years ago I must have inadvertently pissed this individual off enough that they came back to haunt me, years later on my blog, “anonymously.” Curiously, I feel very sad for this person. They can’t be leading a particularly joyful life. Follow me at www.borrowedgenes.com and on Facebook! Links below! Woah some people are weird. Whatever would possess them to leave such awful comments is beyond me. Pfffft. Good on you for tracking the identity of both! I would have been stoked to manage that as well. You have a wonderful attitude about it all. I am glad you didn’t let them get you down. Nice to see you back! Super random, were you guys by chance featured on a certain documentary in 2014? I just watched the episode last night, if that was you. For privacy issues, I wont name it, but for what I briefly know about you through your blog (your son’s name and that you live in Oregon) I put two and two together and though WAIT! I think I’ve connected with her!! Yes! That’s us! It’s wild, by the time it aired we had started well on our adoption journey. We had a donor IVF set up and I cancelled it right midway through, I was just DONE with fertility treatments. Amen to that. I think we are going to do one more round of IVF and then be done. Onto bigger and better things! 🙂 I love hearing your story though! Well don’t give up on motherhood. You are destined for it. Sometimes you just have to step back and listen for your next move. However your babies come to you, they will be your babies. There are so many options. We also strongly considered embryo donation, give that a look if you haven’t already. We explored it all! If you ever have questions, let me know. I’ve probably been through it! people can be so full of hate. I am so sorry for you, I have been waiting for chapter 2, and was excited to see the post come up in my email, but then so very sad for you. We too experienced some ugly pushback with our little G-cakes, and the agency which helped serve us, was just recently the receiver of hateful facebook comments. I can’t wait to continue reading your chapter, and I must say that the adoption was fast for you. Ever so thankful to hold that piece of paper from the Judge! Thank you Jen! There are always a “couple” rotten apples, aren’t there? Other than that it’s been overwhelming support and encouragement. Yes, our adoption did seem to get finalized pretty fast, 2.5 months. The lawyer said it is because it was closed so everything was pretty cut and dried, no variables. Usually it does take longer. I’m sorry to hear you are experiencing hatefulness on FB. How can anyone find anything hateful about such a blessing? It’s just mind boggling! What a set of douche canoes! I can understand your mini break to make sure everyone was safe and glad to know that you wouldn’t let two idiots with nothing better to do rain on your parade. Congratulations on the adoption finalization!!! I’m so pleased for you. Second, I’m sorry you’ve received such hurtful comments. I will never understand how people feel the need to spread such hateful thoughts.